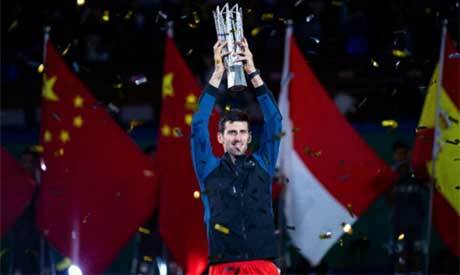 Novak Djokovic is within touching distance of Rafael Nadal's number one ranking after winning the Shanghai Masters with a 6-3, 6-4 victory over Borna Coric on Sunday. The 14-time Grand Slam champion broke the 19th-ranked Croatian -- a good friend and sometime-training partner -- in the sixth game of the first set on the way to another no-nonsense victory. The end was anti-climactic, with the Serb winning the championship point after a video review. Djokovic buried his head in his hand at the absurdity of it. The 31-year-old will leapfrog Roger Federer into second in the world when the rankings are released on Monday and is in imperious form as the season reaches its climax. Red-hot Djokovic has now been victorious in 18 ATP matches in a row and in recent months won Wimbledon, the Cincinnati Masters, the US Open and now Shanghai. The last four months had been "fantastic" and "tremendous", he said. "I'm cherishing every moment of it," he told the crowd, calling Shanghai "a special place" to him. "I could not ask for a better scenario," Djokovic said of his late surge to the summit of men's tennis. "I am very close now to Nadal in the rankings and put myself in a good position for the last period of the year." Coric, 21, said that he had no complaints about losing to "one of the best in the history of tennis". In what was the biggest match of his life, he wore heavy strapping on one thigh and has been troubled by a stiff neck that saw him ponder pulling out before the tournament. But he refused to blame those for defeat to the man he considers something of an idol. "He was the much better player on the court. I was playing good, really, I was really happy how I played," he said. "I felt even if I was serving a little bit better, he'd still return my serves, so there is nothing I can do." This was a fourth Shanghai crown for Djokovic and he is homing in on a return to number one, having fallen as low as 22nd in May as he struggled following elbow surgery in February. He also missed the second half of 2017 with elbow and off-court issues. Coric, the 13th seed, was chasing only the third title of his career and defeated top seed Federer in the semi-finals to underline his rich promise. He also dispensed of three-time Grand Slam winner and Federer's fellow Swiss Stan Wawrinka in his opening match. Coric had the extensive thigh strapping changed for the second set, but he was immediately broken when he somehow sent a routine volley out. He had his first sniff of an opportunity with a break point in the sixth game of the second set, but second seed Djokovic survived when Coric again fired wide. It is nearly two years since Djokovic topped the rankings and he has made it his mission to topple the injured Nadal before the year is out.